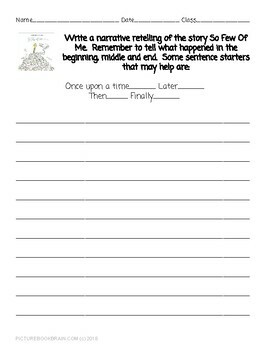 ✏ This is a guided reading or interactive read aloud lesson plan for the Mindfulness mentor text book So Few Of Me by Peter Reynolds. The plans include a teacher script with strategic stopping points and questions for students. 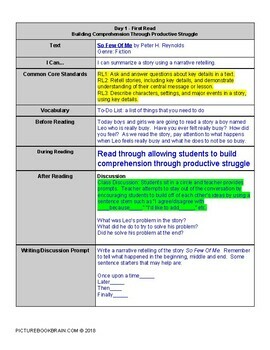 It also includes prompts for student responses in writing or reading response logs. 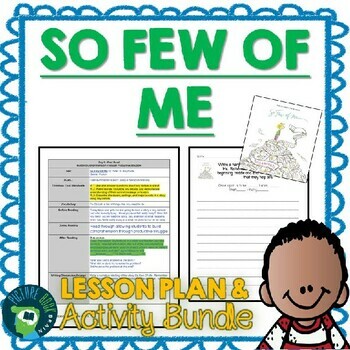 So Few Of Me is the title in English and can be found under the title Leos in Spanish and the lesson lends itself for either English or Spanish or dual language / dual immersion instruction. The printable prompts are in English and also in Spanish. 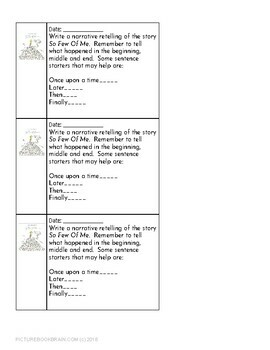 This lesson is focused on a theme of author's craft to convey feelings, central message / lesson, and summarizing but can easily be modified for other uses. If you enjoy this resource, please review it! This will help me make more resources. If you have any questions, I will reply within 24 hours. If you leave feedback on PAID products, you'll receive 1 credit per $1 you have spent... the TpT credits conversion: 20 TpT credits = $1 discount on your next pruchase, so if you have 100 TpT credits (as you left feedback on the items you purchased), you'd get $5 off your next purchase, if you decide to use them in full (as you can use them partly too, in blocks of 20). Copyright (c) Josh Teaches Everything. All rights reserved by author. This file is to be used by the original downloader only. Copying for more than one teacher, classroom, department, school, or school system is prohibited. This product may not be displayed or distributed digitally for public view. Failure to comply is copyright infringement and a violation of the Digital Millenium Copyright Act (DMCA). Clipart and elements found in this PDF are copyrighted and cannot be extracted and used outside of this file without permission or license. Intended for classroom and personal use only.